Published on November 26, 2016 by Martyn. Be the first to comment! I made a rare appearance on television this week when one of the local stations sent along a reporter to Leeds Trinity University to interview me and my PhD student, Liz Flanagan. Liz and I have both been nominated for the prestigious Carnegie Medal – me for Twenty Questions for Gloria; Liz for her YA debut, Eden Summer, which she has been writing for her PhD in Creative Writing. 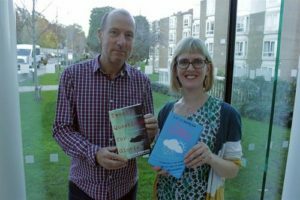 It’s believed to be the first time that a student and supervisor have been in contention for the same literary prize. So, after Leeds Trinity’s marketing department released the news, Made in Leeds TV came along to chat to us in the university library to record an item which was broadcast on the station’s main evening news magazine programme, On the Aire. It was strange to be speaking in front of a TV camera again – the last time was about twenty years ago, when my first novel was published, and I appeared on BBC Look North and Sky’s books programme in the same week. To see the Made in Leeds TV piece please click on this link. It begins 9 mins 40 secs into part 1 of the programme on 24/11.